Did you know that West Antarctica is the most volcanic place on Earth? After a recent and remarkable discovery, scientists have come to realize that there are more volcanoes snoozing away beneath that colossal ice sheet than anywhere else – so where’s all the heat coming from? There are multiple ways to generate magma, the fuel of volcanoes, but scientists couldn’t agree on what exactly was causing all that rock to melt. Now, according to a study in the Journal of Geophysical Research: Solid Earth, it’s almost certainly a hotspot, a monstrous upwelling plume of mantle material that’s scorching the crust and birthing volcanoes. The mantle plume theory has been the leading idea for at least 30 years now, but the plume itself was never conclusively identified, only inferred from activity at the surface. Plenty of people simply couldn’t believe that if there was a gigantic plume – the type that’s seen under Yellowstone, Iceland, or Hawaii – then the world’s largest ice sheet would never have grown to such a remarkable size. Now, using a combination of techniques, a team from NASA’s Jet Propulsion Laboratory (JPL) has painted a detailed picture of the fiery fountain for the first time, if one only inferred from careful computational modelling. For this type of scientific sleuthing, seismic waves are normally employed. These travel at different speeds and angles through different materials and based on this information alone, geoscientists can work out fairly precisely what’s going on beneath their feet. However, the thickness of the Antarctic Ice Sheet and plenty of statistical noise meant this technique wasn’t as reliable as it could be. Instead, the team decided to look at the ice sheet itself. Thanks to the attention West Antarctica has received via climate science, it’s known to a high degree of accuracy how fast various parts of it are melting. Using a complex numerical model, the JPL team concluded that it’s melting consistently enough to suggest a mantle plume is hiding beneath it. In the US, the thermal energy flux up into the upper crust is around 50 milliwatts per square meter (per 10.7 square feet) in regions where there is no volcanic activity. Under Yellowstone, it’s understandably higher, averaging at 200 milliwatts per square meter. 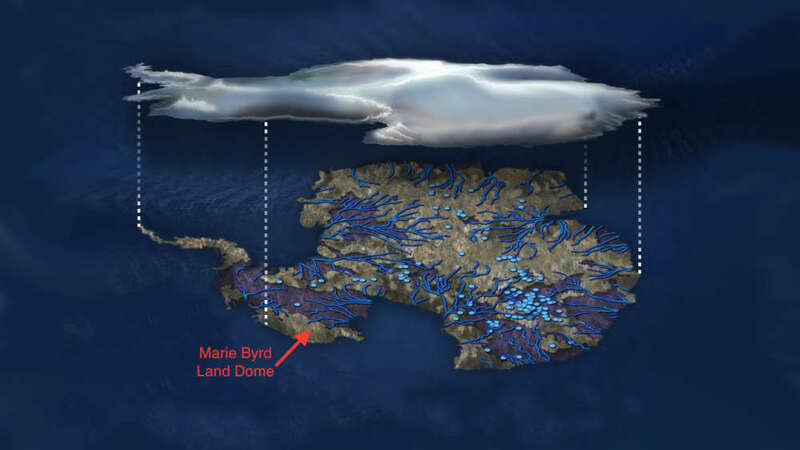 Under the suspiciously dome-shaped Marie Byrd Land in West Antarctica, it’s 150-180 milliwatts per square meter. Indeed, this part of the southern continent shows higher-than-normal meltwater rates, and seismic imaging suggests a crack, or rift in the crust – just like the one in Africa’s Great Rift Valley – is permitting an excess of mantle heat through. Only a ferocious plume could explain all this adequately. It came into existence 50 to 110 million years ago, and has likely been fueling plenty of the ice realm’s volcanoes throughout. An ancient furnace, finally revealed then? Not quite, but this study takes us one step closer.